Exhibit A: shrimp is plentiful. Take a 20-minute ride to Mayport, have lunch at Singletons or Safe Harbor, and you can come home with a bounty of shrimp at a great price. There are also several shrimp shacks on A1A/Mayport Road to buy shrimp at a much-reduced price. Closer to home both Publix and Dan’s Seafood sell Mayport shrimp and will shell if you don’t want to deal with the mess. Tip: DO buy with the head off. It’s pretty nasty snapping those things off. The head on prices are considerably less, but the heads end up weighing a lot. Now you have shrimp in hand. 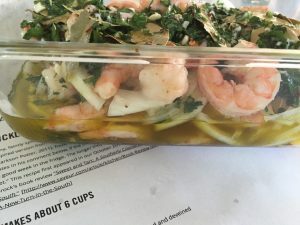 If you are looking for something new to add to your beach picnic let me introduce you to “pickled” shrimp. Rumor has it that it’s a southern staple, but I only just heard about it from my northern city friend. It is a super easy, make ahead, devour later dish. I made mine on Wednesday planning to eat on Friday, finally ate on Sunday. And….it was delish. 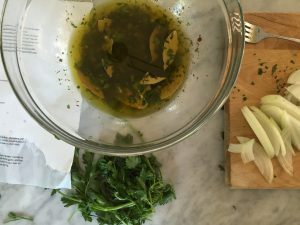 The recipe I used was from Saveur but feel free to find your own, or let us know how you make it.